Returning to the Gornerglacier, in the Swiss Alps, for The Freshwater Project. Amazing to see how fast the glacier is retreating! 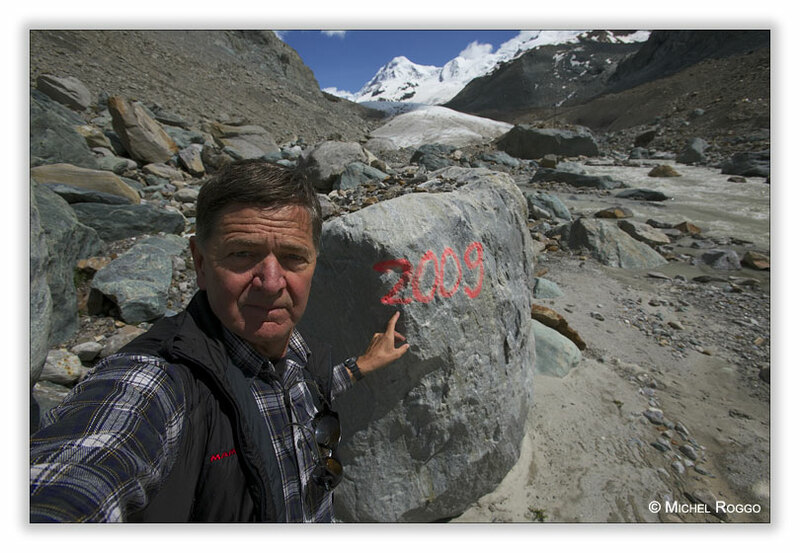 The stone with the 2009 mark is about 300 meters from the glacier portal away! 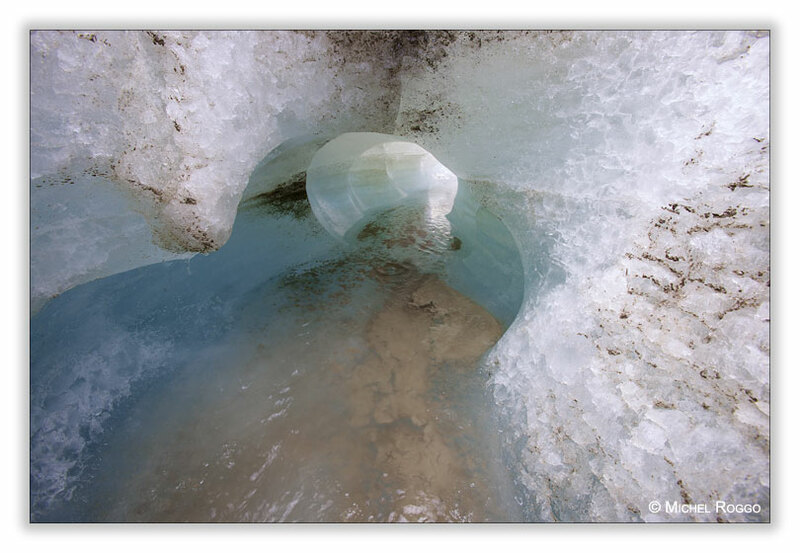 On the glacier, I made some images in the meltwater channels and tunnels. I wanted to continue my work in the meltwater lakes up on the glacier, but I was to exhausted: I had my underwater equipment with me, and you can imagine how heavy my rucksack is with all that stuff ... So I have to go back an other day. Eighty-two of 88 glaciers measured in Switzerland between 2007 and 2008 reduced in length, according to scientists at the Federal Institute of Technology in Zurich. Although the winter of 2007 was one of the snowiest ever – with many stations reporting record snowfalls – this was cancelled out by a hot summer. 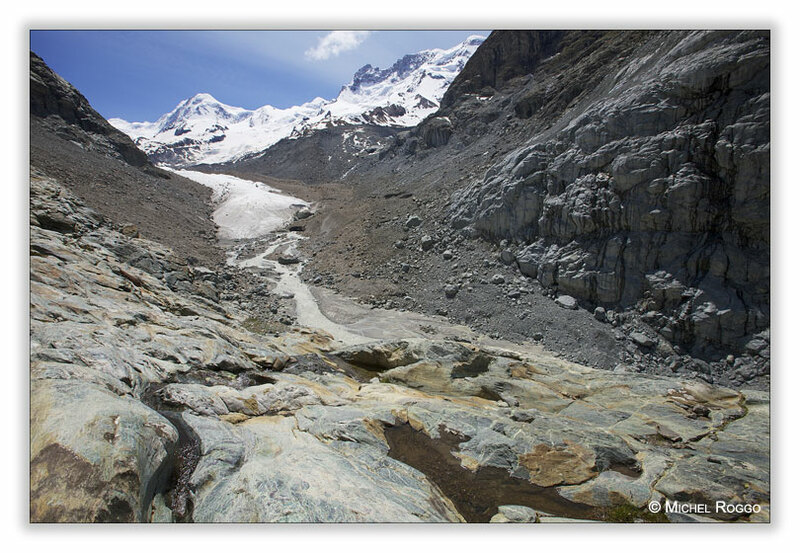 "The measurements confirm once again the ongoing glacial retreat observed over recent years," Andreas Bauder, a glaciologist at the institute, told swissinfo. Bauder, who took part in the study, explained the two types of measurements: length change and mass balance. "We investigated the latest measurements for mass balance – in which one looks at the difference between the accumulation of snow and the melting of the ice – and it more or less reflects the average value of the past ten years," he said. "Length-change information represents the mid- to long term, although it depends on the glacier's size and other factors." For example, whereas only two glaciers got longer and most shrank by less than 25 metres, the Gorner Glacier, a valley glacier found on the Monte Rosa massif close to Zermatt in western Switzerland, withered by 290 metres.